Available to Shambhala urban and residential centres. The Mukpo Standard Flag is composed of six white dots on a black stripe adjacent the colours and animals representing the Four Dignities in four quadrants. 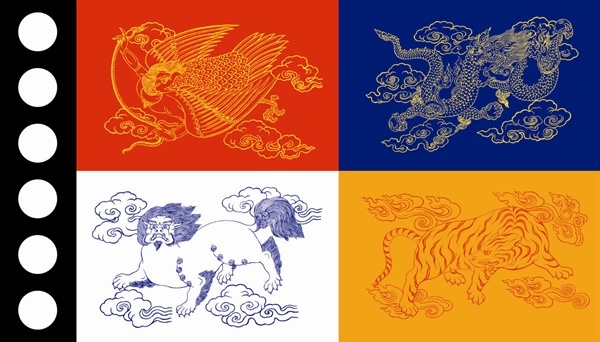 This flag can be posted on an indoor flagpole beside the Sakyong's seat or hung on a wall behind that seat in the main shrine room of your centre. Flags flutter like flashing lightning. Flags are lha objects and should be kept in a high place when not on display. Nothing should be placed on top of flags. Fold flags when not on display: with two people holding the four corners, fold the flag in half lengthwise, and then in half again lengthwise. Then, holding the flag tight on both ends, the person holding the fly end folds one corner toward the opposite side, and repeats. Tuck in the end with the grommets. The end result should be a tight, neat triangle. If flags are wet, do not fold them, but hang them up to dry overnight. If a flag is frayed or torn, repair it immediately as this may prolong the flag’s life. Traditionally, the Dorje Kasung are the caretakers of the “colours” or flags, and are responsible for their ceremonial raising and lowering. However, in the absence of trained kasung, it is still appropriate to fly the colours. Raise the colours in the morning, before 10am. Lower the colours around dusk. Shambhala flags are generally not flown at half-mast for any occasion. If flags are posted on flagpoles indoors, they should remain posted for the duration of the event, and removed at the end of the event. The Mukpo Standard (animals and colours of the four dignities and six white dots on black stripe) may be posted on a flagpole beside the seat of the Sakyong in the Main Shrine Room of your centre, or it may be hung on the wall behind or beside that seat. The Shambhala Standard Flag-- (Yellow disc on a white ground with four dignity colour stripes). The Trident Flag-- (Yellow disc with black trident on white ground). Trident points up. The International Buddhist Flag --Blue flies at the top of the multi- coloured stripe. (blue, yellow, red, white and orange vertical stripes, with a sixth stripe made up of these colours together). 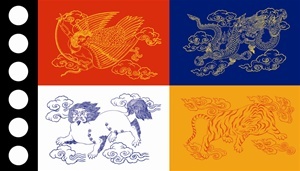 The Sakyong Standard (Colours and animals of the four dignities with a yellow sun disc and scorpion in the centre and six white dots on black stripe) should only be flown when the Sakyong is in residence. The Standard of the Sakyong Wangmo (Mukpo Standard with a purple disc and sun and moon in the centre) should only be flown when the Sakyong Wangmo is in residence. The Standard of the Druk Sakyong Wangmo (Sakyong Wangmo standard with dragon holding the purple disc) should only be flown when the Druk Sakyong Wangmo is in residence. The Council of the Makkyi Rabjam Flag (six pointed iron wheel with yellow disc marked with Morse code “V,” on a white ground) should only be flown when the CMR is present. If the Sakyong, Sakyong Wangmo, or Druk Sakyong Wangmo is present, their standard is flown on the central flagpole. If more than one of them is present, each of their standards is flown, with the Sakyong Standard in the centre. The Sakyong Standard is always raised first and lowered last. The Shambhala Standard Flag is flown on the central flagpole. After the Shambhala Standard Flag, the order of precedence from the centre is: International Buddhist Flag, Centre Flag, Trident Flag, Province, State, or Country Flag.